Our content was too academic and didn’t resonate with our audience. When we focused on making it more readable for our audience, business grew. What about you? Is your brand deliberately centered on readability? When the Dutch government used readability tools, it found its content’s readability level (C1 – see scale below) was too high for the majority of readers in the Netherlands, who are at a B1 readability level. Given that most readers could not fully understand the content distributed by the government, it was not only a waste of taxpayer money but it could have hurt people’s well-being if they couldn’t understand the content related to topics such as social security. When my toddler fell down the stairs, my wife and I were scared. We went into full-on protective mode and searched on Google to see what danger signs to watch for and whether we should take him to the hospital. (He was fine, as it wasn’t a bad fall.) I’d hate to have been reading advice that was too difficult to understand quickly. Especially when panic, stress, and a crying toddler is added to the mix. Yet, though the average American reads at an eighth-grade level, consumer-focused medical content frequently is too complex for the average reader, as shown in a comparative analysis of patient education materials from 16 medical specialties. The good news is these mistakes can be avoided by adopting readability measures as part of your content assessment process. I will take you through nine steps to ensure that your audience is more likely to consume and engage with your content. The relatable point is an essential one. Too much content, particularly on websites, is me-me-me – the brand only talks about itself. Avoid doing that at all costs. For example, turn the focus of how you do something to how your readers can benefit by adopting the same practice. Once you have your first draft ready, it’s time to determine its readability score. You can use one of several free and paid tools. (Disclosure: My company, readable.io, is on one of the lists.) With these tests, you can learn the Flesch-Kincaid U.S. grade level along with other standard readability assessments, such as the Flesch Reading Ease, Gunning Fog Index, CEFR, and SMOG Index. Some highlight word by word (or sentence by sentence), the potential readability challenges. 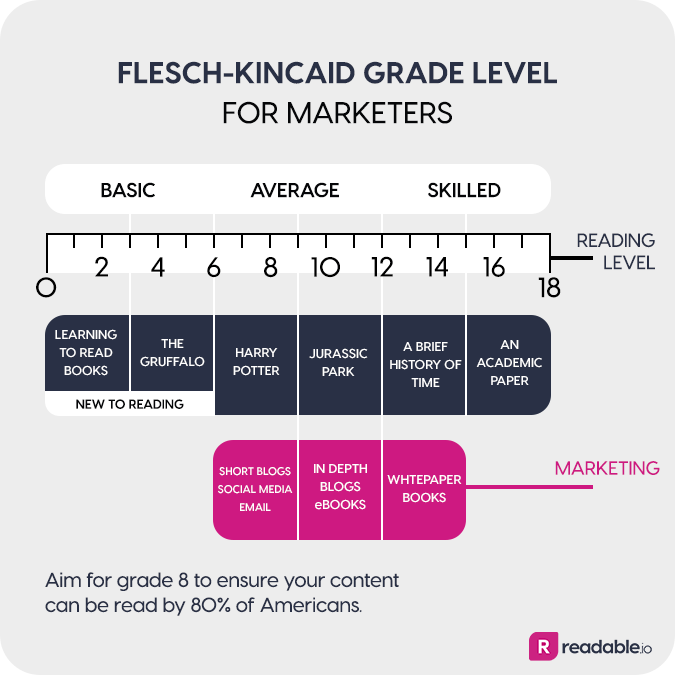 As a general rule of thumb, we aim for a reading level of grade eight for our blog posts – which is the level of a 14- or 15-year-old – to ensure that a wide audience can understand our content. We focus on grade 10 for e-books and grade 12 for white papers and books. 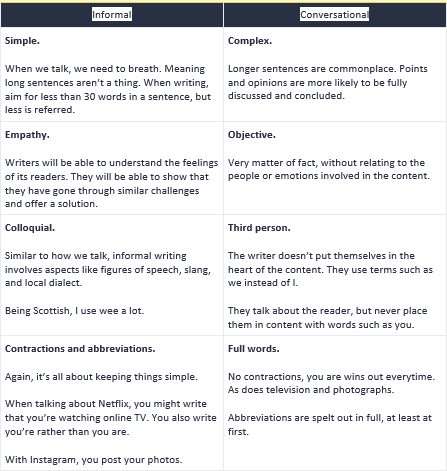 Your personas or audience description will help you pick the right grade level for your content. The No. 1 element that readability algorithms agree on is that long sentences are bad. Thankfully, it’s an easy fix – shorten your sentences. Long words are another red flag for readability. Where possible, look for shorter alternatives (e.g., you might replace the word “alternatives” with “options”). Now, this isn’t always possible, as your organization likely has some words that must be used. Edit to minimize the number of long words but don’t make everything as readable as possible to the detriment of your brand message. 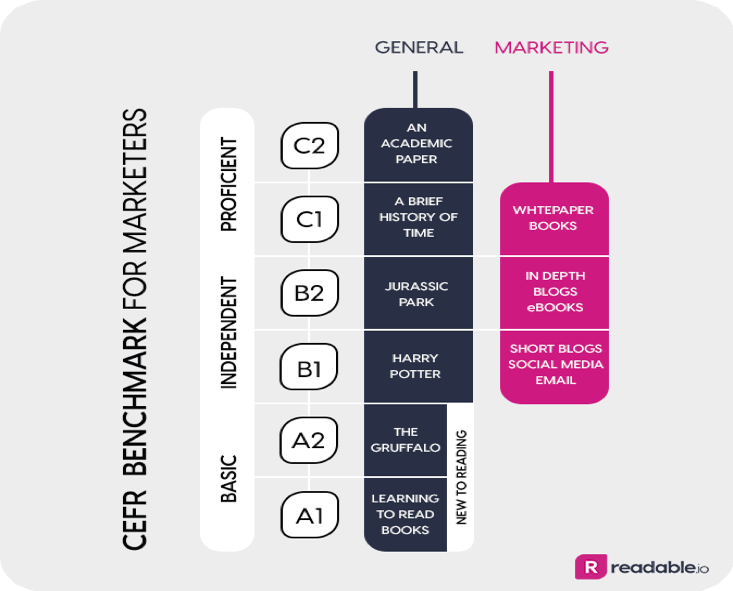 Resist the temptation to fill your content with buzzwords, geekspeak, jargon, or acronyms. They limit the content to those who are already in the know. If you must use challenging terms, explain them. When working in my first job in London, I had the delight of editing blog posts written by structural engineers. They loved to fill their content with as much jargon and as many acronyms as they could to try to look smarter than their peers. They didn’t care about readability and their audience. People frequently tend to liberally overuse adverbs, eventually causing sentences to be really cluttered. If you take all of the adverbs out of that previous sentence, how much better does it sound? Like anything in life, moderation is key. In conversational content, I aim to make it feel like I’m talking directly with you. It makes the reading experience more personal. It also feels more natural to me to write this way, even after years of writing for a B2B audience. Just because you’re writing for business doesn’t mean you have to write with no personality. Make sure the flow of copy is natural and not forced. Common-sense time, again. As many pairs of eyes as possible should read a document before it goes live. As a writer, you can be too close to the text. Another person can give you the perspective of a reader and point out areas of improvement. Keep your audience at the center of everything you do. Inform, educate, or entertain your audience. Keeping things simple isn’t easy, but practice makes better content. 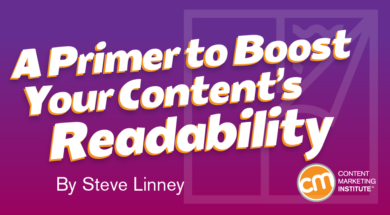 The more you stick to readability principles, the more readily your audience will consume and engage with your content. Check out the readability of CMI’s free weekday newsletter. Subscribe today.